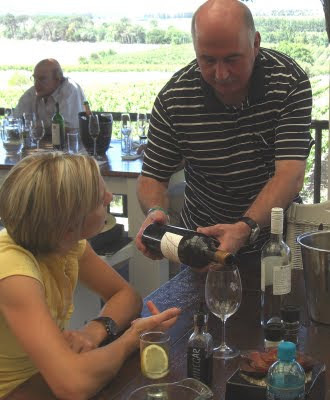 There is no doubt Beyers Truter is the King of Pinotage, but he is also a master of Bordeaux varieties, gaining much kudos for them when at Kanonkop and subsequently for his Beyerskloof ‘field blend’ of Cabernet Sauvignon and Merlot. So when he melds Pinotage, Cabernet and Merlot together you know you’re going to get something special as his Synergy Cape Blends have shown. 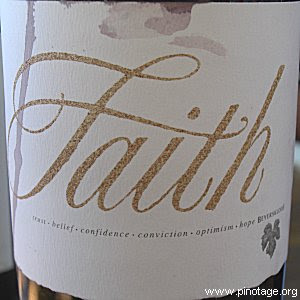 But now comes Faith, a blend of 30% each of Cab and Merlot with 20% each of Pinotage and Shiraz. You’ll have already noted the FAITH logo on the back labels of Beyerskloof wines. FAITH is a charity set up by Truter to aid those affected by Foetal Alcohol syndrome. And what of the wine inside? It has just been bottled but is surprisingly approachable for a wine meant to be aged. It has an incredible red purple colour with a sweet lavender nose and it is soft on the palate; very soft and sweet. I thought it was a tremendous wine. Only ten barrels were made and it is expected to sell at around 750R a bottle. Expensive yes, but every purchase helps the FAITH charity. Beyers Truter is pictured above pouring tastes of Faith to diners in his restaurant. In the Blogs - Ch Leoville-Barton & Rhone?